Finding ways to talk to kids about tough issues can be a challenge. Knowing what to say can be even harder, particularly when it comes to bullying. So when a go-to resource comes along that helps you address kids’ obstacles and concerns, it can be a lifesaver. Behold! Captain Compassion: The Bullying Prevention Superhero! Committee for Children has come up with a fresh new way for parents to teach kids how to use their bystander power to help stop bullying. Equipped with the superpower to inspire others to be kind and respectful in the face of adversity, Captain Compassion is an engaging character parents can use to help communicate the approachable, research-based information we’ve curated on our new bullying prevention website. And she’s a role model for kids, too! In a series of original online comics whose themes are derived from our Second Step Bullying Prevention Unit, Captain Compassion and her sidekick, Kid Kinder, demonstrate different ways kids can recognize, report, and refuse bullying. Also on the site you’ll find helpful videos for parents and kids; a PSA featuring Disney Channel star Skai Jackson; printable infographics for your fridge, classroom wall, or community center; and much more. Take the Pledge, Get the Swag! To help encourage you and your kiddos to help stop bullying, we ask you to take the Captain Compassion Pledge! Once you do, you’ll find fun Captain Compassion digital swag—from coloring pages to a secret message decoder kit—that will remind your kids that everyone has bystander power! If you’re interested in sharing the information you find on the Captain Compassion website, check out our Superhero Toolkit. There you’ll find prepared social media posts, emails, videos, and more to share with friends, colleagues, your PTA, and anyone else you think would benefit from learning about bullying and how to help stop it. 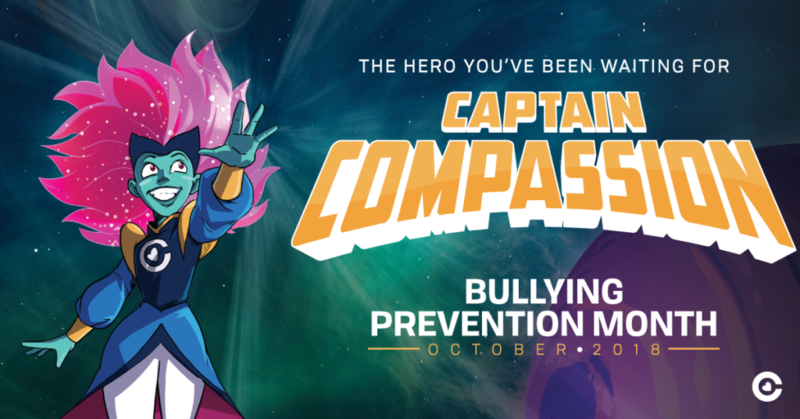 Visit the Captain Compassion page today to learn how you—and everyone—can create a world without bullying.